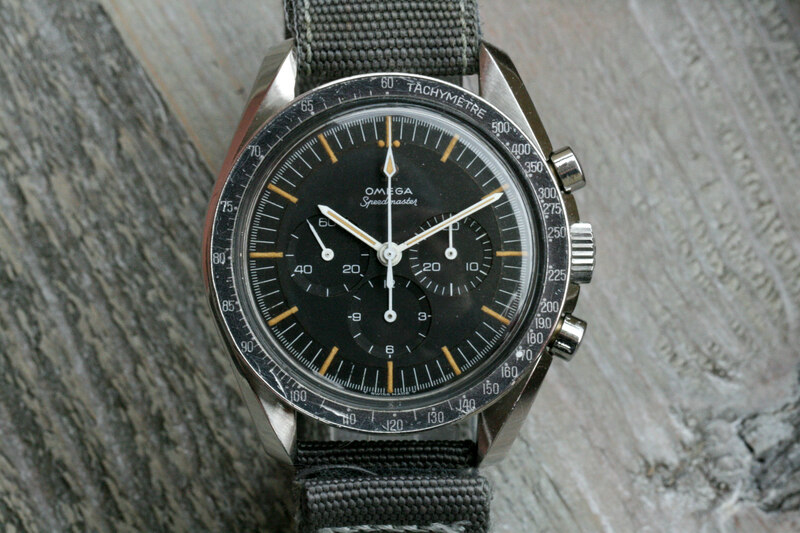 The professional Speedmaster was a landmark piece for Omega. The design made it through all of NASA’s resistance tests, beating out others specifically designed for the task. The ST 105.012 was chosen for Apollo missions and remains a favorite amongst collectors today. Production is estimated near 24000 with substantially fewer in condition that could be called ‘collectible.’ Even rarer is this specific two-liner dial variation. The pumpkin colored tritium here is perfectly appropriate for the age. Its ghosted bezel is a beautiful contrast with the unspotted two-line dial. The case, at a glance, looks as though it may have been polished. However, it’s hard to tell if that is simply a light wear over the ages with graceful case transitions. This is the sort of vintage find that distinguishes an entire collection. Tasteful to a fault. Find it here from Austrian seller Peierl for 16900 EUR.